With a nod to the arseblogger, who enhanced my vocabulary with the word, I’m going to start off with an almighty *boilk*, a stag weekend having taken away by ability to speak, type, or make any sort of sense whatsoever. I would say I’m not drinking again for a while if I wasn’t going on another one this weekend. There is much to cover, far too much for one entry, so David Dein and Diarra can wait for a while, possibly alongside dreadful Derby and devilishly daring Denilson for some extra alliterative emphasis. The football itself takes priority, as it always has and always will, and it is there that we begin, with the extremely impressive Sunday lunchtime victory over Pompey. We have a habit of drawing with Portsmouth, so it was always going to be a challenge, especially against a keeper in David James who has thwarted us in the past, and has a point to prove in trying to resurrect his international career. All the more ironic, then, that it was his error that gifted the lead inside ten minutes. Rushing off his line in a race with Van Persie, you could immediately see who was going to win, and sure enough, the Dutchman clipped it past him and then got sent flying. The tradition of the fouled player not taking the spot kick was then continued, Adebayor coolly slotting into the corner. Much of the first half passed without further incident, until Fabregas, getting in where it counts, reacted quicker than anyone else when the ball dropped to him at a corner. A quick spin later, and it was 2-0, Cesc scoring his fourth of the season already. The full backs, especially Clichy, were causing absolute havoc but I have to say they were being allowed to – we are so used to seeing teams biting into tackles that it was a real surprise to see Portsmouth look so lethargic. There seemed to be very little fight, minimal closing down, and one thing is for sure – if you don’t battle against Arsenal, you’ll pay. That’s why everyone does it. The second half saw a brief scare, when Senderos, who up until that point had been playing superbly, got himself in a horrible position, and then clumsily challenged Kanu as he tried to recover. There was very little contact, but the ungainly nature of the challenge gave Halsey little option but to give it, and as the last man the red card was inevitable. Some may say it was a harsh sending off, but I can see why it happened. Big Phil will be disappointed though, as his confidence seemed to be returning. 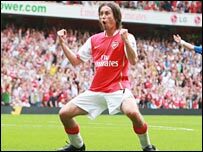 Worries were soon put to bed though, when a bit of quick thinking from Cesc (and the Pompey defence having the reactions of a comatose sloth) saw him tap a quick free kick to Rosicky, who lashed home a beautifully angled shot, through Glen Johnson’s legs, into the corner. Within a minute, Pompey had a consolation, and it has to go down as one of the flukiest you’ll ever see, Kanu kicking the ball against his standing leg and it arcing into the corner. With luck like that, any team can score on any day, so you could say that we’re lucky it arrived when 3-0 up against a side playing as poorly as they were. Diaby should’ve added a fourth, somehow heading wide from Clichy’s pinpoint cross, but overall the display was excellent – Cesc pulling all the strings in midfield while the full backs went on the rampage. When Gilberto moved back into defence following the red card, he was outstanding, and it is there that I think he may find himself playing more and more. I’ll come back to that another time. The strides this team have made recently are clear for all to see, especially in midfield, where everyone seems to have upped their game, both in fight and in creative end product. Carry that on, and there will be plenty of wins even when the strikers have off days, something that was always missing before. With Chelsea losing, it is us and Liverpool who are chirpiest at the moment, both impressively sitting joint top with ten points from four games, with so many others having played five. We’re only missing the maximum because of Lehmann’s howler, and ‘Pool are because of Rob Stiles awarding Chelsea a phantom penalty, so there’s plenty for both clubs to be happy about. International break now, which’ll give me the time to write about all the other topics going on right now, before the Tottenham game in two weeks.